“I just wanted to let you know that the girls from Troop 3334 really enjoyed the MasterClass for Annie on Broadway. 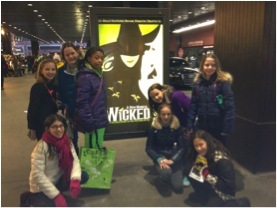 In fact, they enjoyed the workshop more than the actual Broadway show!! GSCNC Public Relations featured the girls’ NYC story and photos in the Troop News Section at: http://www.gscnc.org/Troop_News.html (scroll down to What Can a Cookie Do and click on the photo for the slide show; also click on attached photos). Please extend my thanks to Desi, Amy, and everyone at StudentsLive and Pearl Studios for a wonderful, unforgettable experience. The girls will always remember to SMILE!" ...of the teachers we have worked with in the past feel their students would be motivated to read/see other plays as a result of having participated in our programs. ...of the teachers feel that the experience of seeing a professional Broadway production has been an excellent teaching tool for students in the classroom. ...of the teachers felt the education package was extremely helpful in creating integrated lesson plans for their students. ...of the teachers would return with new students. ...of the teachers who have attended other Broadway education programs felt that our programs were far more comprehensive, organized and exciting than the others. “Wow! Cannot say enough about how great it was working with all of you on Saturday. Julie, who would have known you were new to mix as you carried yourself with confidence and were great in cheering with crowd outside. Jess, as I told you, you are one cool customer and handle issues with grace, creativity and care. And, last but certainly not least, Amy, you are Disney-esque in your care for the customer and ability to create something wonderful. -Maria Oaechea, High Tech H.S. -Yurely Ramirez, High Tech H.S. -Danielle Rose Tamayo, High Tech H.S. -Nancy Sauers, Girl Scout Mom, Holland, PA.
Kelly Crandall, Actress in “Chicago"
"This was the most well prepared and well-executed education program I have attended." "Any grade or class subject! This was a wonderful day that all students should get to experience!" "I would not have given that moment when I was up on a Broadway stage up for anything." "Thank you for an AMAZING EXPERIENCE! The girls had a blast. A few of them did attend the Wicked for Good program in the past and thought that was a once in a life time experience but they were blown away with this smaller hands on program with Phantom. Later in the afternoon I did find out that for more than half of my girls, that attended on Saturday, this was their first Broadway experience ever! Kelly Grant was wonderful and for them to see and connect with her in the show that afternoon was a wonderful way to introduce them to the magnificent world of Broadway Theater. " "We had an amazing day. I have never been disappointed with the Student Live programs. I am still in awe of what an incredible experience we had yesterday. Donald was amazing in the class and even better in the show. I know the students will cherish that memory always. Thank you so much!" "We had a great dinner. They loved the show and I took them backstage after. Thank you for this opportunity to work with Students Live and please let me know how else I can get involved in this great organization." "I loved working and learning from you. I cannot wait to continue bringing this experience to the students. I am in an area that does not get that much art related experience. You are so great at what you do! Your enthusiasm just encourages not only the girls but us, as adults to want more of these experiences for our girls. Thank you so much for all you have done!" "Today was stunning & an unforgettable experience for these kids and their band director. Thanks again for doing what you do with StudentsLive to bring this opportunity to the kids." 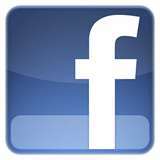 -Cindy Westby, Educational Travel Specialist, Omega National Travel Inc.
"I have no idea where to begin in explaining our experiences this past Saturday with Students Live. It was phenomenal. My girls were still singing on the bus ride home to DC yesterday. I cannot tell you the impact that the workshop had on our girls. Everyone participated in the workshop and was sad when it was over. The momentum of instruction was excellent. Please know that we will be returning to NY and your program in the future. Thank you again for a wonderful opportunity." "We just want to thank Jessica and Amy for the planning and preparation. Our troops and adults had a great time and loved the program. Thanks again and we look forward to our next StudentsLive experience!!" "Wow! Cannot say enough about how great it was working with all of you on Saturday. Julie, who would have known you were new to mix as you carried yourself with confidence and were great in cheering with crowd outside. Jess, as I told you, you are one cool customer and handle issues with grace, creativity and care. And, last but certainly not least, Amy, you are Disney-esque in your care for the customer and ability to create something wonderful. Additional thanks for inviting Sophie on stage with the Dance Captains. She was aglow all weekend and will not soon forget that experience. I loved this program with my scouts and can easily say it was even better as a volunteer—a great lesson in management and service for my girls." "It was AWESOME! Brought several girls and some adults to their very first Broadway show! All 56 of us from Delaware had a great time! Can't wait to see Cinderella in the fall!" "Just wanted to let you know that we had a great time at the "For Good" Wicked event this weekend. All the Scouts and Moms enjoyed the workshop and of course the matinee of "Wicked." We absolutely loved our seats in the orchestra area for the Workshop and especially appreciated it in relation to where our seats for the show were (the very back of the upper Mezzanine.) It was a real treat to be up so close to the stage and really get to see the costumes and watch you all perform and interact during the workshop. My oldest daughter has always been part of crew for her school theater productions and this is the first year she has decided to try her hand at acting and will be playing several parts in a production of "The Laramie Project" this weekend. The workshop and the seating up close was especially enjoyable to her because of her interest in all the aspects of theater. Thanks again for the experience for all of the Scouts." "We had a wonderful experience. It was such a pleasure to share this with the girls. The speakers, actors, dancers were on point and very engaging. I hope to continue the Broadway tradition with my daughter and sharing it with girl scouts made it even more pleasurable." "It was amazing! We loved it! The Girls and adults were very engaged and had many glowing remarks." "The discussion from the costume designer, dancers and the interaction with choreography [was favorite part of workshop]." "The workshop and the show were awesome! Both the girls and adults accompanying them all enjoyed them very much." "Speaking for myself (Cal Elite dance team director) the parents and kids, we thoroughly enjoyed the workshop and of course the musical as well. I was very skeptic of the workshop when I found out it was NOT a purely dancing workshop. But was THRILLED as to how interesting, informative and fun it was for our dance team. We would do it once a year if it was handled just the same for a different musical every year at the Orange County Performing Arts Center. This area is saturated with dance teams that I know would love it as well. And I would help you with local studio names to support it. 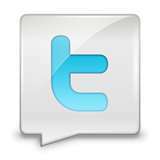 Looking forward to a Student's Live every year." "Of all the education programs we have attended, the Teaching Artist and Cast Members were the most interactive, and energetic. This made for a wonderful experience." "I just wanted to let you know that we had a totally amazing time. The StudentsLive Workshop was fantastic as well as Wicked! This will be a highly recommended show and program." 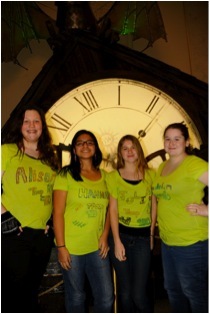 "I just came back from seeing Wicked and attending your workshop and I would appreciate it if you could say thanks for the people who planned it because it was truly a great experience!" "Thank you so much for all the work you did for Saturday's Wicked performance. 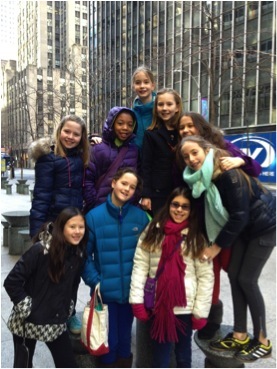 My troop thoroughly enjoyed their trip to New York. We stayed in Secaucus NJ and took the NJ Transit in for the day. Please, try and keep these programs alive, and if another one comes up, include me on the email." "Thank you very much for this wonderful experience! The girls in my troop and the moms who attended the event were blown away with the quality of the workshop and the exciting performances. Everything was so well done that they are already asking for more. Thanks again so very much!!" "Thanks for a great workshop and providing my troop with the opportunity of a lifetime! My girls had a great time and this will be one of those things my girls will remember forever..."
"Girl Scouts always promotes understanding of others, helping others, being a sister to every scout, improving the world around them, etc. The themes of the show and workshop showed how significant these values and ideas are in life." "My daughter attended the "All that Jazz" workshop yesterday at the Orange County Performing Arts. I cannot tell you what a great program your group performed. The entire crew was fun, energetic and so professional. We've attended many plays here, L.A. and New York but my daughter's never been as interested as she was yesterday when watching Chicago. She knew so much more about the show, the characters, the actors and the dance routines. You're offering a great service to our children." "It was much more than I expected. There was so much audience participation, I was very impressed. The actors were great; they really seemed to enjoy being there with the girls. This was very well put together…We just LOVED IT." "Thank you again for a wonderful workshop. The girls commented that the performance was even more entertaining because they could watch the cast members that had spoken to them. 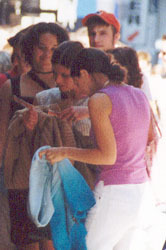 The girls were constantly engaged and they never stopped moving. The choreography section was fantastic. The way that the audience was involved was great. Our Girl Scout troop drove 2 hours from the desert and we were thrilled to participate. We shared the information with two other troops in our area and they attended and were equally pleased. We would make every effort to participate in the future. The moms had a great time too!" "I just wanted to say thank you once again for the wonderful time that our family experienced with StudentsLive this past weekend. It's always a pleasure working with StudentsLive. You're always professional and the programs are of such quality! The educational components of the program bring a little personality and fun to something that is much larger and such an important piece of culture and learning. What excitement it sparked! And, in the couple of hours between the workshop and the show, my children were sharing memories and songs from "Wicked." Your programs have definitely made a lasting impression on them! I can hear it in their voices when they talk about them or sing a piece of one of the songs, and for that I am quite grateful. Keep doing what you're doing because you're doing it right! Thank you!!!!" "We are very grateful for the opportunity to be part of such a beautiful experience - the time and attention given to young people who love theatre was outstanding!" "It truly was a memorable day all around, my students had the time of their lives-and so did their teachers!" "We absolutely would return for more programs in the future. Actually, my students are already begging me to plan another trip!" "The workshop was wonderful! Everyone said it was fantastic! Thumbs up all the way!" "First and foremost, I would just like to say that the complete workshop was exceptionally interesting, breathtaking, educational, and very worthwhile." 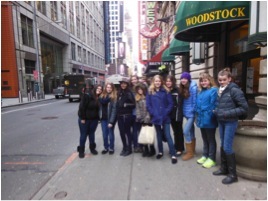 "Our group had a great time and it was certainly a highlight of our trip to NYC. The show was great and the girls are talking about wanting to see more theater- certainly a reflection on the effect of the workshop and the show combined. What a great program you have and what a welcoming team you have been to work with. " "I cannot begin to tell you how remarkable the experience I had with my daughter at Career Day. I was also so happy and proud, as a SU manager for Hillsborough that several other troops from my town attended. I can't begin to say enough kind things about StudentsLive especially their team speaking about the principles that the girl Scouts live by and comparing them to the company's mission. The Broadway Guest Artists were wonderful with the Scouts. I cannot thank everyone enough." "I have to tell you it took me a bit to respond because …. I got choked up. This is amazing … way cooler than I thought it would be and I am so excited for our event. I had to look at it again tonight so I could relax and enjoy it. What a wonderful time we are going to have….Thank you for making my dreams come true….. you know I love Mamma Mia it's my favorite because of that song, I have a dream! And this is going to really fulfill one of mine. Seeing the girls grow through this experience. Thanks!" "I've been attending musical theater since the 1970s and I don't recall anything that compares to the visceral and emotional experience like I had the pleasure of witnessing today. The amount of work in "Journey to America" was not only evident but awe-inspiring. Kudos and BRAVO to all of you. You are not only entertaining people but changing lives." "The show was amazing. The audience was obviously the Who's Who of Broadway. Ben Vereen give me a break. Thank you for inviting us to the show. All were impressed. There wasn't a dry eye in the house." "Thinking of the wonderful creative work you do with children... I heard your show was phenomenal. And I know there is going to be a huge need for this when the aftermath of all the senseless violence comes to pass... Keep up the great work." "The students performed the piece seamlessly. This program should become an integral part of all students United Nations Conference." "Without exaggeration, FROM AVENIDA VIEIRA SOUTO TO BROADWAY demonstrated the very essence of theatre both in performance and all that which contributed to its creation. From the moment the students entered the room as auditioning artists for A CHORUS LINE to the closing strains of "Good Morning Starshine", the expression on each and every face reflected the importance of the moment, much as if standing on an actual Broadway stage rather than within a tiny rehearsal space. As such, a communication was established and sustained, actor to audience, heart to heart, the audience responding in kind. The performances were beyond compare, in dialogue, lyric and choreography, the degree of difficulty one which an established professional would find daunting. What was achieved by FROM AVENIDA VIEIRA SOUTO TO BROADWAY illustrates what's possible in international outreach, the result actual, not merely a dream." "Thank you. I think the work was incredible. You are true professionals, and the kids were amazing." "StudentsLive provides its students the best the Broadway industry has to offer. From actors at the top of their game, to set designers, casting directors, etc., the program exposes its students to industry professionals giving them the opportunity to learn from the absolute best!" -Benton Whitley Casting Director, Duncan Stewart & Co.
"This evening I had the opportunity to see an inspired production by StudentsLive! With a wonderful group of Korean children who sang and danced like pros and they did not sing, dance or speak English, nor know each other three weeks ago. It made me smile and cry...so touching. Amy Weinstein is the Producer of this remarkable exchange that epitomizes what arts education should look like. Whenever I next post that one of these shows is about to happen, please go see it. You will be glad you did." "Last night, I found myself drowned in a sea of madness- tears of joy- I could feel the essence of life's energy in its rawest form... it was a release of the creative spirit... What the Greeks called "exultation of the spirit" -Theatre Pure and Simple. I tried to console one or two but there was obviously no need, they were not really sad, nor could you tell if they were happy due to a cultural / language barrier - I am not sure what these children were thinking but there feelings were as real, perhaps more real than any collection of moments that I ever felt in a crowd of strangers- suddenly I became the strangers and within moments that sense of alienated self-vanished as well and I found myself TRULY surrendering to the creative moment. It was one of the most liberating experiences of my life on or off stage. There was identity and anonymity, there was fear and security, there was pain and there was peace--- there was a heightened reality that touched my heart and made me feel like I was part of something very real, sincere and something that arrived at the very essence and purpose of art. You are doing very important work. I am honored to know an angel like you, you brought so much love into one space last night, it was staggering." "I know what it takes to pull off such a piece and to add in the language barrier—impressive. Those kids clearly had a special experience." "Well…speechless might be an appropriate word for me to describe my feelings after witnessing the recent StudentsLive Production in NYC. As a second language specialist, I struggle daily with the area of English as a second language and how we, as an Institute can best instruct foreign students. Sacred Heart University engages in constant research and professional development with all English instructors to ensure the most contemporary and effective pedagogical methods of instruction are used. Not only did I witness an incredibly energetic, emotional, engaging, fun performance from students, I was constantly astounded by their capacity to acquire a language to such a skill level in such a short space of time. This program is truly remarkable in that it accomplishes a level of understanding of the English language, but that it also demonstrates the wonderfully rich and vibrant American culture that Broadway alone has a magical way of portraying. " "The students were absolutely adorable and did such a fantastic job. I had the widest smile on my face throughout the entire show and am amazed at what you were able to accomplish in so little time. They were all truly stars!" "I am an educator of ESL through Theatre at a Japanese college in Boston. Recently, I read a script and Study Guide of "Journey to America." I found the script and Study Guide exhilarating." "While I expected to enjoy it, I never thought that I would be so involved with the passion these kids had for what they were doing. I could see clearly into so many pairs of eyes that they loved what they were doing and singing about. Whether it's a little girl aptly named Rose, belting out the end of "Roses Turn", or having a young girl sing "I Dreamed a Dream" when her life has barely begun, this was an experience I will remember and share with others for a long time." "StudentsLive has facilitated a unique, living program that embodies commitment and passion to sharing of theater to children, of the international community, that's both priceless and bold. They're a shining tower for all to look upon and admire." "Friday night was such a pleasure to be a part of. Both myself and my partner were so moved and thankful to have been witness to the students performing. I'm so happy to hear such celebrated professionals singing the praises of StudentsLive and the performance. I have always been and will always be a fan. It was an amazing experience." "Friday's performance was very inspiring. I've been working as a professional actor since I was 15 and over those 11 years, I have had to do frightening things. I moved away from home to graduate High School and then again for college and once more to move to NYC. Soon after, I packed my bags again to travel the globe with CHICAGO. Seeing these students perform in the music theatre capital from shows that many in the audience have or are doing was inspirational. I can't imagine the risk it is to be in a city/country for the first time and doing so with only 2 weeks of rehearsals. It put me back in touch with the kid that moved to NYC with only a dream, a degree and $500 dollars in his pocket. "I really felt the experience the Brazilian students had by watching their performance- it was the pure magic of Broadway at work. The students, coming from different walks of life, came together and immersed the beauty of theater, resulting in an artistic connection to the audience regardless of background. When you connect to the arts, it is amazing. StudentsLive is fantastic for inspiring beauty and life through the arts. Congratulations." "Personally, I get inspired when art transcends language barriers among other obstacles! My wife and I were both moved and are still reminded of the several moments we were overrun with goose bumps while in the studio. We definitely want to be at the next event and cannot wait! "After working with the students on a Broadway MasterClass the same week, seeing the amount of growth the students learned from this program only shows us that arts and theater really bring students to a better understanding of different cultures and art forms. Bravo!" "I am so grateful and honored to have been a part of this program with these exceptional students. Watching them perform brought me a sense of realism that anyone that works hard and fights through difficult programs and work can do what they want to do. Grateful, humbled and honored." "It was absolutely wonderful, moving, and an incredible opportunity for the students. Clearly, you provided them with the experience of a lifetime and they did not want the program to end. "It was such a pleasure seeing the students perform, and to have worked with them. It is never too late to start performing. I began at 17- the same age as some of the students that took part in this program, and to see their growth is an honor. It is great they can take what they have learned over the course of the 2 weeks and use it to better themselves and their talents." "To see the passion and caring on stage was nothing less than inspirational. Congrats on a great performance. Remember to carry this passion forward into everything you do." I honestly was blown away by the amount of material the kids mastered in such a short time and the talent, dedication, and polish that I saw onstage. Absolute commitment poured from every single student which is a testimony to everyone's work both onstage and off. I hope that every student remembers this moment- the moment that they created magic together. "It was inspiring to see the passion displayed in the Brazilian performance from both students and teachers. I saw each student connecting to the musical selections they were given and really making an effort to connect with the audience. I also saw the connection the instructors felt towards the students after the performance. They spoke with sincere encouragement and affirmed the hard work that each student had given. You've really created a unique experience where active Broadway performers have a chance to make an immediate difference in the lives of aspiring artists, and students have a chance to realize they're truly an integral part of this industry. You nurture a genuine love for the performing arts with every opportunity you give to your students." "What an AMAZING performance! I was moved to tears! It was so powerful and courageous. What you and your team accomplished with 8 rehearsals only just blew our minds away! We clapped, laughed and cried all at once." "Wow! I cried though the first 5 numbers and three more times throughout the course of the show. What you put together is incredible. It reminded me of the magic of Broadway and how lucky we all are to be a part of this. More importantly what it can do for these children, how it can bring them out of their shells. You did a wonderful job. I was honored to be a guest." "The show is absolutely a success. The kids have presented the best they learned from the Broadway professionals in a very short period. To watch these kids performing on the stage is very inspiring to us. We hope we can bring this exciting program to the Chinese kids, and sincerely wish one day our Chinese kids will give such a great performance in the near future." "In my experience building extra-curricular activities/programs in Singapore with the Ministry of Education, "Fear" is a common topic for these students to overcome. What I've seen from this program not only allowed these South Korean students to overcome their fears, but more importantly build their courage from within. On top of personal development achieved by these students, their command of English has surpassed my expectations in such a short period of time. I am baffled by what this program can achieve in such a short period of time." "It was an unbelievable experience. Actually, I have no words to describe it. I went to New York, first of all, to learn about the city and Broadway itself. Adding to that, I wanted to have the opportunity to get in touch with the artists that work on Broadway. By doing that, I saw that Broadway is not all about song, dance or acting; it is about doing everything together, every time. It is about believing in your story, every second, and making it come true. One thing that can summarize is that I went to Broadway to try to learn how to make magic happen and I came back to Brazil with the feeling that the "seed of magic" is inside me. I know now that it will grow and I hope I will be there (Broadway) someday. The program is the opportunity to open your mind to something bigger than Broadway or Hollywood. It is a place where you can face the artist inside you and then let him/her shine." "I appreciate all you have done for me so far. I love you today and forever. My heart and soul is given to all." "Thank you for being there for us. If it wasn't for you, we wouldn't be who we are today." “Friday's performance was very inspiring. I've been working as a professional actor since I was 15 and over those 11 years, I have had to do frightening things. I moved away from home to graduate High School and then again for college and once more to move to NYC. Soon after, I packed my bags again to travel the globe with CHICAGO. Seeing these students perform in the music theatre capital from shows that many in the audience have or are doing was inspirational. I can't imagine the risk it is to be in a city/country for the first time and doing so with only 2 weeks of rehearsals. It put me back in touch with the kid that moved to NYC with only a dream, a degree and $500 dollars in his pocket. “Personally, I get inspired when art transcends language barriers among other obstacles! My wife and I were both moved and are still reminded of the several moments we were overrun with goose bumps while in the studio. We definitely want to be at the next event and cannot wait! “It was absolutely wonderful, moving, and an incredible opportunity for the students. Clearly, you provided them with the experience of a lifetime and they did not want the program to end.